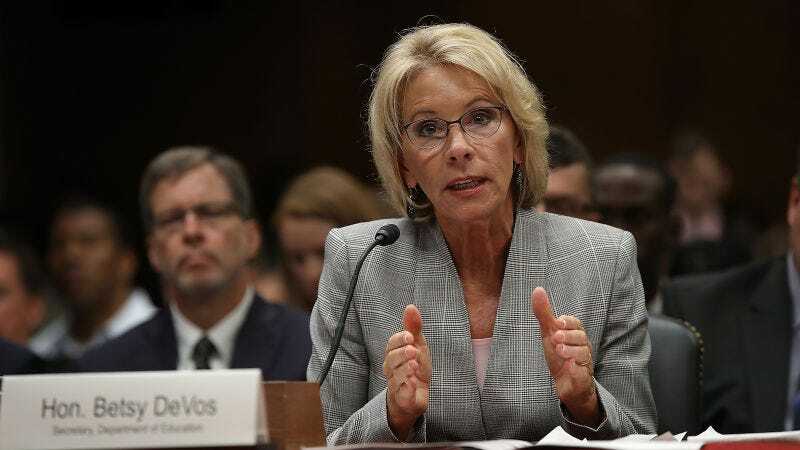 Buzzfeed News reported on Monday that our billionaire, bear-fearing, MRA-loving Education Secretary Betsy DeVos will probably unveil her long-awaited changes to Title IX policy enforcement at George Mason University this Thursday. Federal officials have been describing the event as “centered around equal opportunity and equal protection for all,” which, coming from this administration, is always a sign of something dismal that needs its transparent justification. In other miserable Education Department news, DeVos has yet to respond to the administration’s DACA decision. Standing up for young people not really her thing. Correction: This article previously ran with the headline stating that Betsy DeVos will reportedly roll back Title IX. The report stated that DeVos planned to make an announcement, but definitely that Title IX would be rolled back. Jezebel regrets the error.